Finding the motivation to exercise alone can be hard. So why not surround yourself with people who love working out? At FLX Fitclub, you’ll find a wide variety of group classes led by an outstanding team of instructors who will get you excited about fitness. 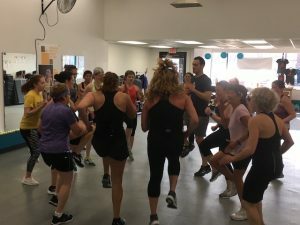 Plus, we get to know you, and whether you’re a beginner or a group fitness veteran, we’ll help you adjust the workout intensity so you get great results at your pace. 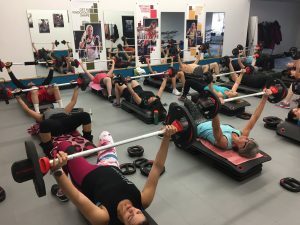 Try a class with our motivating instructors and welcoming community, and see how the energy of the group can help you do more than you could by yourself. You’ll leave sweaty, satisfied and feeling amazing. Pretty soon you won’t want to miss a workout! New? Check out our First Timer’s Special! We feature the world class Les Mills workout programs, with motivating music and innovative moves designed by experts to be safe and effective. We’ve got you covered, with everything from indoor cycling to weight training to sports-inspired cardio and more. You’ll get great results (and have fun in the process). Our rockstar instructor team will motivate you to do more than you thought you could, even on days when you can barely make yourself get out of bed. We’ve got loads of experience and advanced training, and we each bring a different personality to the classes we teach. You’re sure to find someone who fits your style. Want a place where you’re surrounded by friendly people who love working out? 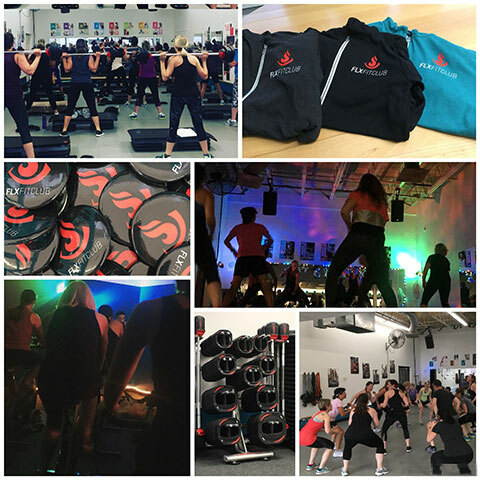 The energy of our community helps take your workout experience to the next level. Sometimes a high five from a classmate is all you need to keep pushing when you’re running out of gas. And who knows, you might even find a few friends here! The instructors are the best! Most knowledgeable, motivating and all amazing athletes. Les Mills is the best group exercise program for attaining all around fitness. It transformed me! Lots of variety and something for every age group, fitness level and gender, and truly just fun. I feel my hours at FLX Fitclub to be the highlight of my day. The FLX teachers are the best. 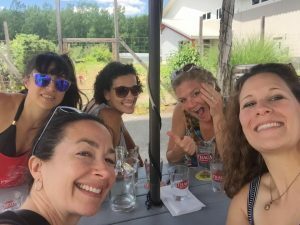 When I started I was out of shape, weak and discouraged – the FLX teachers really helped me get my strength and energy back after my second child was born. I always felt welcomed, encouraged and (most importantly) motivated to keep coming back! I am just so happy when I walk in to FLX. I’m not anonymous, I’ve made lots of gym friends and every instructor knows my name. How cool is that? Just go through the FLX Fitclub door. It will mark the first day of the new you. The club members are as awesome as the instructors. A great group to workout with.